Provide comfort for the family of Willie C. "Cal" Taylor with a meaningful gesture of sympathy. Willie C. “Cal” Taylor, age 89, of Nixon, passed away December 7, 2018 at his home near Nixon. 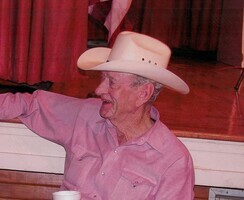 Cal resided most of his life in Live Oak County and McMullin County. He was born in Taft, Texas, on March 11, 1929, to William Sherman and Miemme Elizabeth Alexander Taylor. He proudly served his country in the U.S. Army. Cal was preceded in death by his parents; his first wife, Mildred Faye (Nesloney) Taylor; his second wife, Clara Leonora (Weinert) Taylor; his son-in-law, Mike Dusek; a step-daughter, Marci Wilson; and 7 brothers and sisters. He is survived by his children: Rebecca Faye Taylor and Willie C. Taylor, Jr.; grandchildren: Shellie Faye McCumber (Little John), Theresa Kaye Chudej (Bryan), Kathryn Anne Hardcastle, William Andrew “Beau” Hardcastle Jr. (Michelle), Brandon Lee Dusek (Amanda), Bradley Aeron Dusek (Liza), Calvin Cody Taylor, Susan Jane DaShae Edwards (Daniel); 21 great-grandchildren; 4 great-great-grandchildren; numerous nieces and nephews, as well as other loving family and many friends. A visitation will be held Sunday, December 9, 2018, from 4 PM – 8 PM at Finch Funeral Chapel in Nixon. The first funeral service will be held Monday, December 10, 2018 at 10:00 AM at Finch Funeral Chapel in Nixon with Pastor Rhonda Troll officiating. A second funeral service will be held Tuesday, December 11, 2018, at 10:00 AM at Roberson Funeral Home, 212 West Hwy. 72, Three Rivers, Texas, with burial following at the Calliham Cemetery, Calliham, Texas. Also, a memorial mass will be held at St. Joseph Catholic Church in Nixon on Saturday, December 8, at 6:30 PM, and on Sunday, December 9, at 9:00 AM. Memorial contributions may be made to the charity of one’s choice. To send flowers in memory of Willie C. "Cal" Taylor, please visit our Heartfelt Sympathies Store. Burial will follow 2nd funeral service at 10:00 AM at Roberson Funeral Home, 212 West Hwy. 72, Three Rivers, Texas. We encourage you to share your most beloved memories of Willie C. "Cal" here, so that the family and other loved ones can always see it. You can upload cherished photographs, or share your favorite stories, and can even comment on those shared by others. Provide comfort for the family of Willie C. "Cal" Taylor by sending flowers. Sissy, Brother, I am so sorry for your loss. My prayers go out to you and your family.